I Got Caught Wearing my Life Jacket! Happy Memorial Day Weekend! Fran Campbell Team wants to make sure that everyone living, traveling to and enjoy Lake of the Ozarks this weekend is safe. 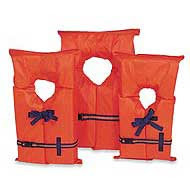 Below you will find an article about life jacket safety, and how to get your kids enthused about being safe on the Lake - Enjoy! LAKE OZARK, Mo. -- AmerenUE will once again join the Missouri State Water Patrol in promoting the importance of wearing life jackets while boating on the Lake of the Ozarks. The main focus of the project is on children, since Missouri law requires that children under the age of seven wear a life jacket when aboard a boat. The project is also intended to help educate everyone about the importance of wearing life jackets. AmerenUE has provided the Water Patrol with T-shirts bearing the message, “I got caught wearing my life jacket.” Water Patrol officers will hand out the T-shirts as a reward to children “caught” wearing their life jackets throughout the summer boating season. Memorial Day Weekend. What is it all about? Fran Campbell Team wanted to take a moment to honor the true meaning of Memorial Day. While we are thrilled that so many people enjoy their "long weekend" at Lake of the Ozarks, we also wanted to remind everyone of why we actually have this holiday. Magic Dragon Street Meet & Open Houses! It is so rare that we have to utter the words, "Is there anything to do this weekend?" here at Lake of the Ozarks. And this weekend is no exception. The Magic Dragon Street Meet Nationals is a unique show for all makes, models, and years of cars, trucks, and motorcycles. The show celebrated its 20th year in 2008 and 2009 promises to be the best ever! For the May, 2009 show, they expect an attendance of well over 700 vehicles. Located in Central Missouri, they bring 20 years of show experience to the historic Bagnell Dam Strip at the Lake of the Ozarks. The strip is closed to normal traffic during show hours, so we only have show vehicles. This creates and absolutely electric atmosphere! Some say it’s like being on the set of “American Graffiti”. For more details about the Magic Dragon Street Meet please go to http://www.magicdragonstreetmeet.com/.